Having seen this series on DVD in ASDA, I was immediately drawn to it… particularly seeing that it was so cheap. I started watching it last night… and finished the whole thing today. I found myself drawn into this world really easily. Although the idea of having people developing different abilities isn’t a unique one, I liked the way it was played out in this series. There was a good mix of thriller and science fiction, I felt. Although I liked all of the characters in this series, my favourite was probably Gary. Not only was he good at relieving the tension, but I really liked the fact that an autistic character was one of the main people. There wasn’t a huge cast of recurring characters, but I liked seeing about their different abilities. It was good to see them play off each other. I did like Cameron. Although he wasn’t a part of the team to begin with, I had a lot of sympathy for him in the first episode. The first episode was particularly creepy and I thought it did a good job of setting the tone for the rest of the series. I would have liked the opportunity to see Cameron interacting with his son and his ex-wife. I really liked Bill’s character. He was interesting and it was really good to have the opportunity to see him interacting with his wife. While I would have liked to know a bit more about their relationship and if his wife actually knows about him being an Alpha, I liked what I saw of her character. It was good to be able to see the family life of some of the other characters, such as Rachel’s relationship with her parents. I had a lot of sympathy for her, knowing that her parents probably treated her differently due to her being an Alpha. I was glad to see the possibility of reconciliation with her father, at least. There were some really gory scenes in this series, in particular when there were murders happening. I really liked the banter between Gary and Bill and I did have some sympathy for Gary’s mother. While I could empathise with his eventual need for independence, I could see she wanted to keep him safe and protected. I also liked seeing Gary’s interactions with Anna. I would have liked to see more of those. 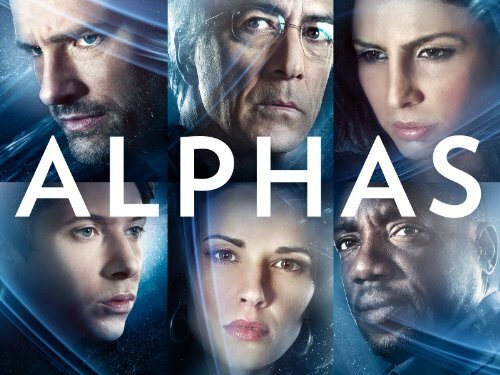 It was interesting to be able to see the different types of Alpha abilities and watching this series has made me want to see series two. I liked the friendships between the characters and I especially liked the times when the danger they were in felt real. I didn’t like Clay’s character, even though I could understand him… but I thought that Rosen was doing the best he could when faced with people who had abilities he didn’t share.